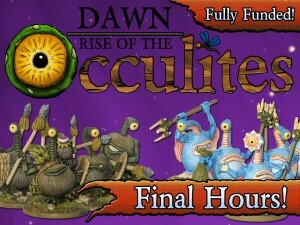 Eagle Games is under two days left on Kickstarter for their Dawn: Rise of the Occulites Kickstarter campaign. They've made it over $50k, so there's plenty of extras flying around. The campaign for Dawn - Rise of the Occulites is almost finished. With 48 hours to go, we have knocked down 5 stretch goals, unlocked all 5 Occulites Tribes, an extra Luftle Pack and many additional cards. Dawn is a uniquely fun game that allows you to scale the complexity to suit your playing group.